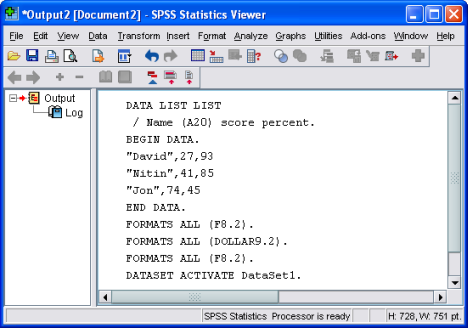 SPSS is a software package used for conducting statistical analyses, manipulating data, and generating tables and graphs that summarize data. Statistical analyses range from basic descriptive statistics, such as averages and frequencies, to advanced inferential statistics, such as regression models, analysis of variance, and factor analysis. The Data Editor window displays the contents of the working dataset. It is arranged in a spreadsheet format that contains variables in columns and cases in rows. Data view : It is the spreadsheet that is visible when you first open the Data Editor; this sheet contains the data. Unlike MS Excel, formulas and variable names cannot be entered here. 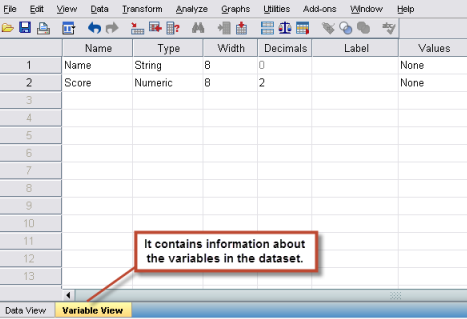 Variable view : It contains information about the variables in the data set. 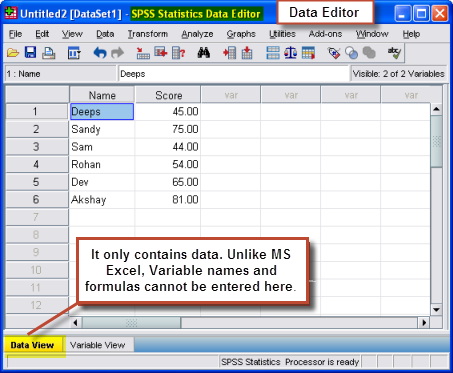 Another important window in the SPSS environment is the Syntax Editor. 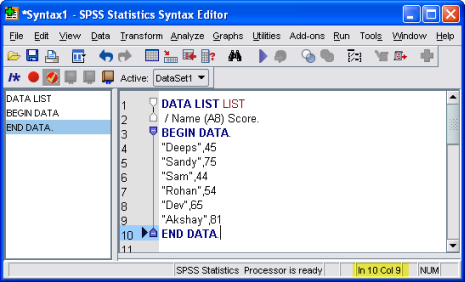 In earlier versions of SPSS, all of the procedures performed by SPSS were submitted through the use of syntax, which instructed SPSS on how to process your data.Using SPSS syntax allows you access to additional commands which are not available through the menus and dialog boxes, and syntax files can be stored and rerun at a later date, allowing you to repeat an analysis. When you execute a command for a statistical analysis, regardless of whether you used syntax or dialog boxes, the output will be printed in the Output Viewer. 3 Responses to "Introduction to SPSS"
Is there any tutorials on STATA software?